Notes by Susan Billetdeaux: Magnolia Warblers frequently fan their tails, revealing wide white patches on each side of the tail. They prefer to stay low in trees and bushes as they forage for food. 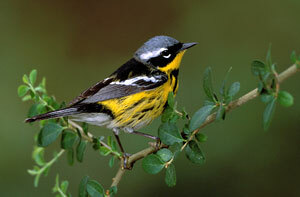 The female lacks the black face mask of the male and the breast streaks are much fainter. The song is a weety-weety-weeteo whistle. Comments by Don Verser: Magnolia Warbler can be surprisingly dull in the fall and look in some ways similar to Nashville. Magnolia, however, has wing bars and white undertail coverts. And my favorite field mark to see on Magnolias in any season is the distinctively patterned undertail that is white on inner half and black on outer half. Only American Redstart has a similar undertail look.